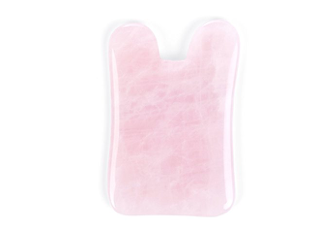 NATURAL ROSE QUARTZ: PEARLY Gua Sha boards are made out of all natural rose quartz stone, so each massaging beauty tool is one-of-a-kind when it comes to the color, texture and size of it. HIGH QUALITY STONE: The rose quartz used to carve our Gua Sha board is carefully selected for its strength, beauty and durability. SKIN RENEWAL: Slide the smooth massaging tools along your skin in an upward motion with a moderate amount of gentle pressure to improve microcirculation of facial blood vessels, increase blood flow and enhance the functioning of the lymph nodes. TARGETED TREATMENT IN DIFFERENT PARTS-And that the different shape of those lets you use them on any part of the body, including the face, neck, head, shoulders and Feet.